Your best friend finally sent her best recipe to you by e-mail? This will of course fit neatly into your recipe collection with Evernote. So, you highlight the text in the e-mail, press Ctrl+C or right click -> copy and click.to Evernote and the recipe is immediately saved as a note. 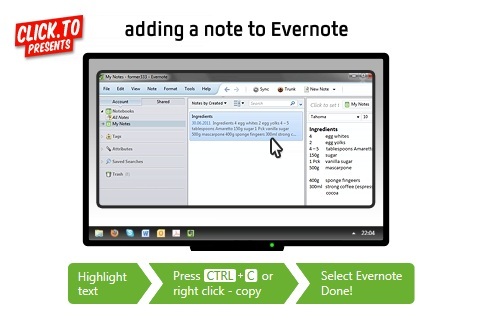 Since Evernote synchronizes your notes with your Evernote account, the recipe is already available everywhere. If you have Evernote installed on your smartphone, you can always view the recipes on the go – for example, when shopping. Images you would like to upload to Evernote, be they images from a web page or from your Explorer, can be added with one click in your notebook. To do this, simply highlight the pictures, press Ctrl+C and choose the Satellite ‘Evernote’. Instantly your image is saved as a note. You’re skyping with your best friend and you want to save an image of what he or she looks like with glasses? Just press the “print” button and you have already completed the task with click.to. Evernote is your collection of curious things. If it is necessary to add a PDF document to a note collection, why not just add? Simply flag the PDF in your Explorer, press Ctrl+C and easily click your document to Evernote. Simple, right? 1 Evernote Premium users can store any kind of file types. The free account already covers images, audio files, PDFs and digital signature files.